and the Association of Scotland's Self-Caterers. Lothian House is an Art-Deco building listed for its architectural interest. 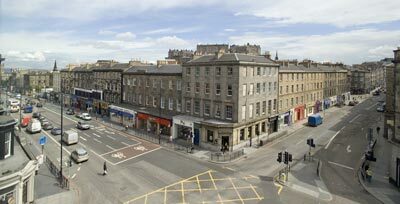 It is located on Lothian Road within the heart of the beautiful city of Edinburgh. 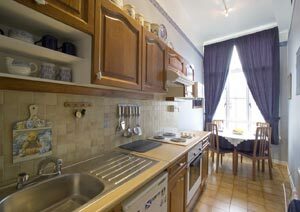 Apartment 39 is situated on the third floor and is fully self-contained. The large white windows of No 39 are visible in the centre of the facade of Lothian House in the photograph (above right). It has panoramic views including Edinburgh Castle (in the centre on the horizon, (left)). Princes Street is just at the end of the road on the left. Recent interior redecoration and furnishings are of the highest standards, as required for Four-Star Self-Catering status from VisitScotland (formerly the Scottish Tourist Board). This compact apartment is ideally suited for a couple, although the small double sofa-bed in the lounge can accommodate a further 2 guests. An entry-phone system and security entrance door provide access to the foyer, with stairway and elevator servicing all floors. 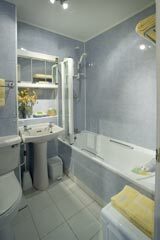 Lothian House has a heated Swimming Pool, Sauna and Gymnasium (see below). Widescreen LCD Digital TV with Teletext & Remote Control (also monitors swimming pool and front entrance). DVD Player - Complimentary DVD movies provided. Hi-Fi system with CD Player. Panoramic views to the Firth of Forth and Edinburgh Castle. All bed linen (incl. Sofa-bed) provided. Wall Mounted LDC Digital TV With DVD Player. Shaver point for US and EU. Electric cooking hob and oven. Crockery, cutlery, glassware, and cooking utensils. Dining table with seating for four. A "Welcome Breakfast Package" is also included. 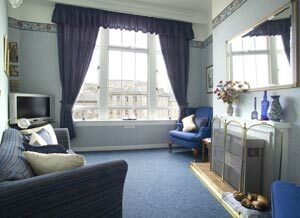 Rates quoted based on minimum stay of 3 nights, 7 nights during Edinburgh Festival and Hogmanay. (2 nights may be accepted with surcharge). Mastercard and Visa accepted with 5% surcharge. Gas, electricity, quality bedlinen, tablelinens, towels included. Complimentary: generous 'Welcome Continental Breakfast Package', toiletries and many extras to help make visit more enjoyable and comfortable. Value-added Honeymoon Hideaway and Romantic Rendezvous Packages. Further Discounted Basic Break and Late Availability offers. (or to the email address above). Please say you found Apartment 39 Lothian House, in About Scotland! The private Leisure Complex in the basement of Lothian House contains a swimming pool, sauna, gymnasium and recreation area. Inspection is invited and should you decide to take advantage of these leisure facilities there will be no extra charges. Additional facilities in Lothian House include security access, a laundry room with coin operated washing machines and dryers, and two lifts/elevators. 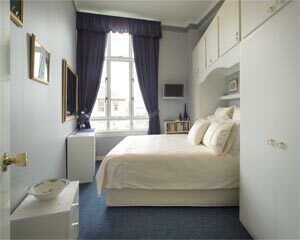 Conveniently located within minutes walk of Princes Street and the Gardens, Edinburgh Castle, Royal Mile, Grassmarket and the historic Old Town. The Edinburgh International Conference Centre, The Usher Hall, the Traverse, Lyceum and King's Theatres are all in the immediate vicinity. 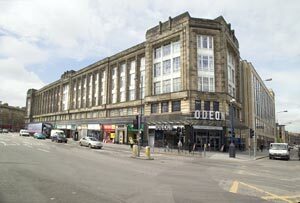 The area is well provided with many cinemas, restaurants, popular take-away food outlets, clubs, pubs, shops, cafes (including an internet cafe) banking and business facilities. Access to public transport is easy with buses and taxis readily available. The Edinburgh Sheraton Grand is only a few doors away and the Caledonian Hotel is also close by on Lothian Road. There are several large public Car Parks nearby: behind Lothian House in Semple Street, at the Conference Centre in Morrison Street, off Fountainbridge and in Castle Terrace.